Ancient Arts (http://www.ancientartsstainedglass.com) has completed two large stained glass creations inspired by the stained glass designs of Frank Lloyd Wright (1867 - 1959). The residents of the Palos Verdes Peninsula in Southern California recently purchased a home in the beautiful and secluded community of Rolling Hills. The main entrance of the home opens onto a long perpendicular corridor that extends more than 60 feet from the master bedroom to the kitchen. At either end of this high ceilinged space is a trapezoidal opening, approximately 5' x 5', formerly containing rustic wagon wheels. The openings were finished and stained by a carpenter and a painter working on the home. 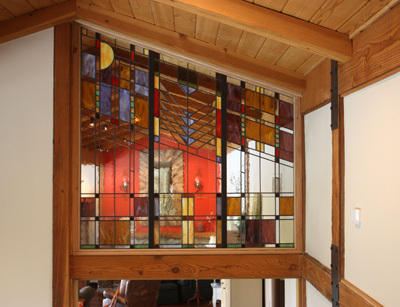 Ancient Arts Stained Glass divided each opening into 3 vertical sections using 1-1/4" T bar. 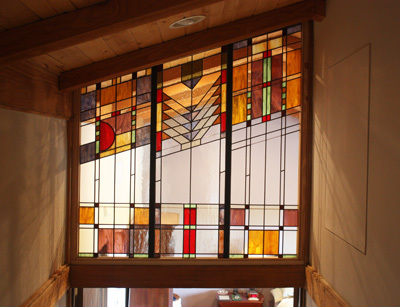 The structural stability of the stained glass is enhanced by keeping the sections to a reasonable size. The strength of the stained glass is also enhanced by judiciously placed reinforcement bars. The homeowners expressed their delight in the completed artwork and we hope its beauty will enhance their environment and their lives for many, many years.